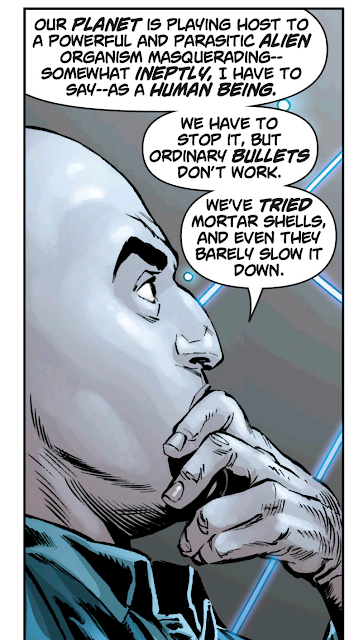 DC did a lot of slate-wiping with their New 52 launch. It's been lauded and criticized, but it makes for a good jumping in point, since Superman's comic: Action Comics, has kept its original numbering (and I assume it continuity) since the '30s... that's a lot. I'm not going to rehash what I think of the relaunch. I will tell you that there are two superman comics going on, not to mention one about Supergirl, Superboy, the Justice League, a team-up with Batman, a team-up with Wonder Woman, and a trinity with all three. I'm just... it's a lot. What I also understand is that they aren't all happening concurrently (unlike a launch from the 80s?) so if I chose to only stick with one for the time being, it could be a lot worse. In fact, Action Comics takes place a year before Justice League. Why do I feel that brand of energy drink belongs to you? So, tonally different according to folks on the internet. 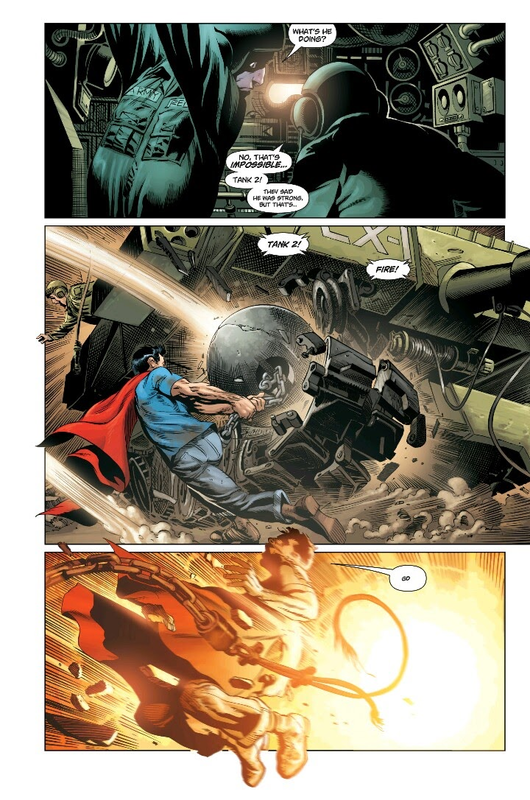 Action Comics gives us Clark Kent/Kal-el in the 20s. 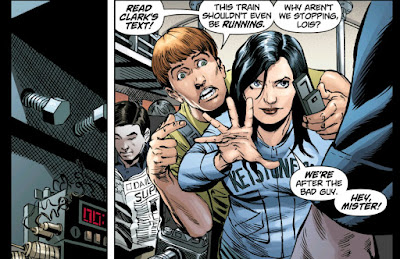 He's not working for the Daily Prophet apparently (or maybe Lois Lane isn't?) 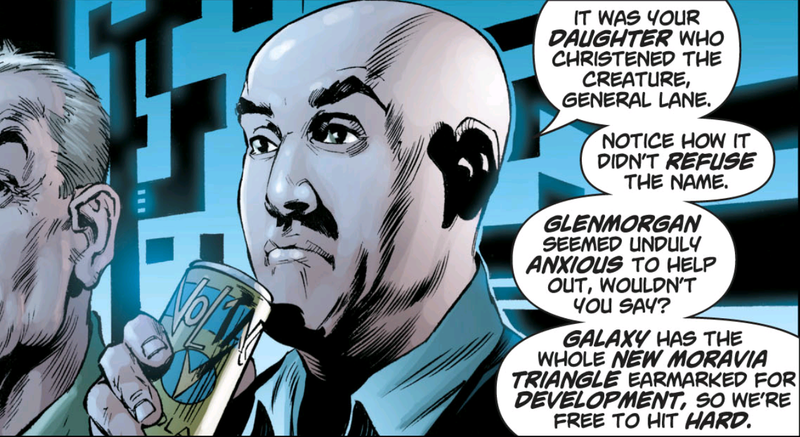 we meet Lex Luthor standing around and smirking, shooting the breeze with a general who is Lois Lane's dad (???). The Superman title is... sometime in the future... I'll read and let you know. 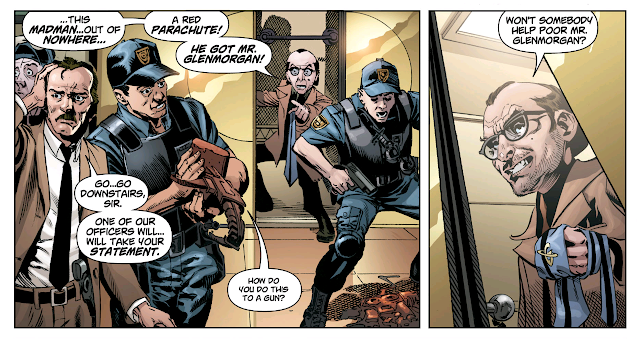 I really liked how he jumped down onto his roof where his laundry was drying, and since his 'costume' consists of jeans, was able to just throw a frumpy sweater on top of his tight super-t. We established his land-lady here, already met the police force that is really willing to shoot at Superman, a dude named Blake, and next meet Lois Lane sorta, through Clark Kent's "best friend for six months" Jimmy Olson. 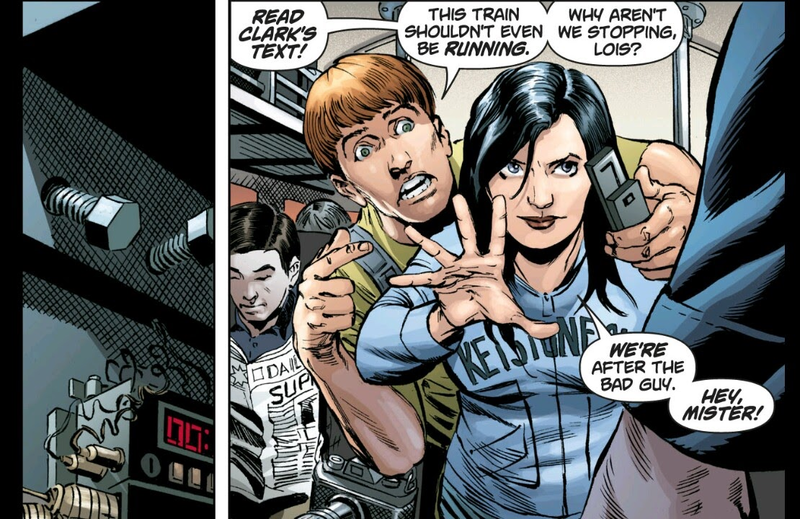 Superman calls in his latest story (squeezing you out of the by-line, Lois) to Jimmy Olsen. 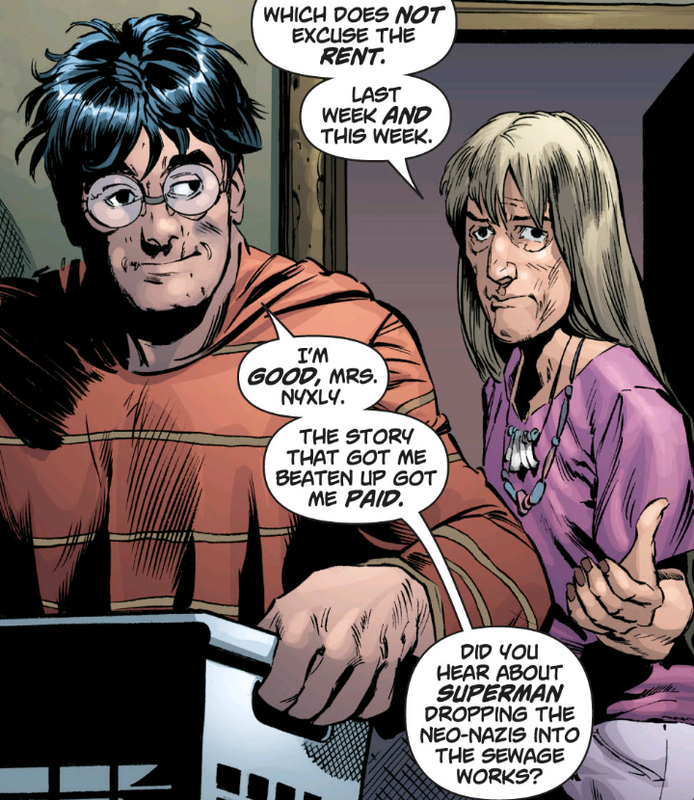 So he's lying to Mrs. N, but anyway, standing next to Jimmy is Lois Lane. So, fine, they don't meet each other yet, she vaguely knows who he is anyway, but she's being her sassy-self and thinks he's trying to ruin a rival paper. Turns out they couldn't drop a good lead and he had to save them by stopping a speeding bullet... train. Hah. 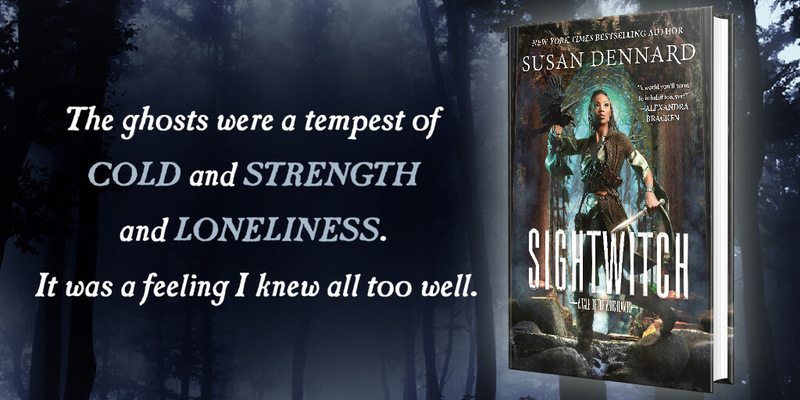 I liked it, in the end, but I knew I'd like him. He's not really relatable yet, because we know so little about him. This is a warmer superman, but somehow he's as accessible as Lex Luthor who is supposed to fit into the box of 'mystery man'. 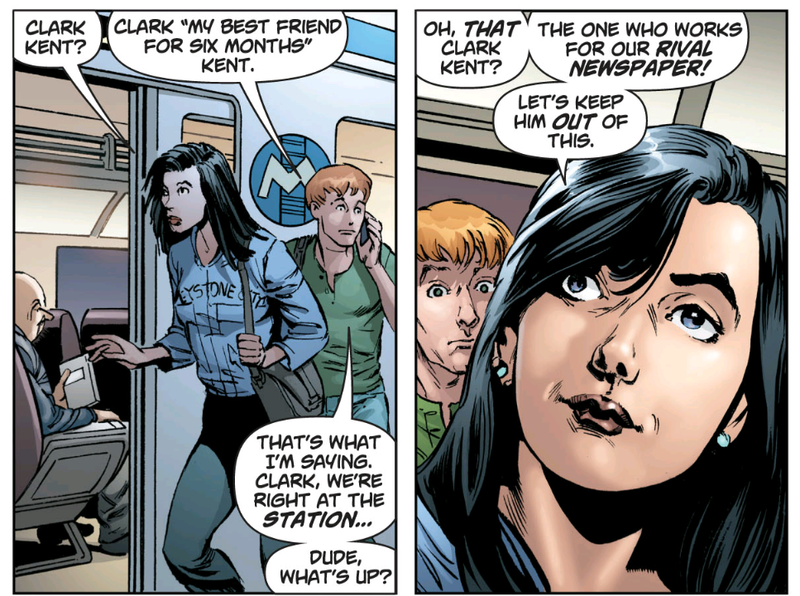 In contrast, we have a better picture of Lois by what she says about Clark Kent. Her character is much clearer. But maybe that's because we demand a more complete story of why a hero is saving people. I like the angle of Superman being hunted by the police though. Even if Blake is, so far, lacking anything interesting to distinguish him. But this is only the first issue! Action wise, it really draws you in, here's hoping the story can carry through the next few issues. 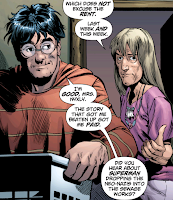 And the art is really good in some cases, showing how fragile this superman is. I don't understand why Superman and several other characters throughout, the general at one point, a wrecking-ball survivor, also have crossed eyes. It must be some kind of error of the inker or the penciller. 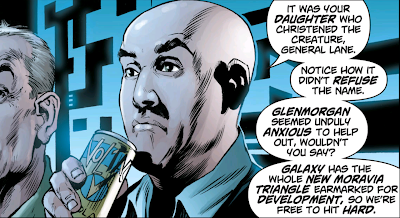 So, Lex's plot has succeeded, with the help of other criminals he endangered a crap-load of people (gosh they're desperate aren't they) and caught superman. He's some bonus, Lois Lane channeling her inner Scarlet Witch. No mutants in this universe, lady!